This title is a little misleading. Homeowners are not responsible for physically pumping and disposing of the waste in their septic tank; instead they are responsible for making sure that the professionals they hire follow the laws regarding septic tank pumping and dispose of waste properly. What comes after a septic tank pumping? In the San Antonio and surrounding area, waste haulers—including the vacuum trucks like Van Delden’s that are used for septic tank pumping—dispose of wastewater at the San Antonio Water System Dos Rios treatment plant. Each waste hauler must maintain a permit, and pays fees each time the truck unloads. The waste unloaded from the vacuum trucks is recorded, and the septic pumping service provider is given a ticket, or manifest, that certifies that the waste was delivered and disposed of properly. You, the homeowner, are the generator of the liquid waste in your septic tank — therefore you are legally responsible for making sure the waste collected during your septic pumping is disposed of correctly. If you live in the San Antonio and surrounding areas, be sure you receive a copy of the SAWS (San Antonio Water System) manifest ticket your septic pumping service provider received from the Dos Rios treatment plant. 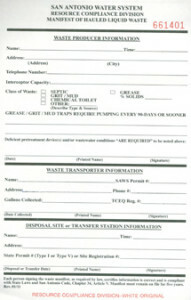 Waste haulers are required to provide you with a completed ticket within 15 days of disposal. Do not let this slide, as the ticket is the only record of proof that your waste was disposed of in a legal and proper manner. Van Delden Wastewater Systems is dedicated to providing our customers with the best in septic tank pumping service. We follow all city, state, and national laws when pumping and disposing of waste. Need a septic tank pumping or have questions on how to maintain a healthy septic system? Please contact us online or give us a call today.